In summer I could eat only ice creams, popsicles, smoothies and salads, I love them! It’s so hot here in the South of Spain and we need to eat fresh recipes to beat the heat. 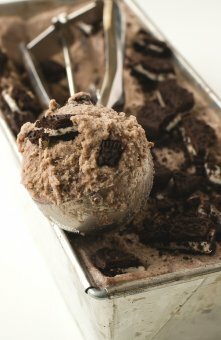 This 4 ingredient vegan Oreo ice cream is so amazing, it’s simple and it’s one of my favorite ice cream recipes. You can make ice cream with an ice cream maker, but it’s not necessary, you can make it using a bowl, a spoon and a freezer-safe container. 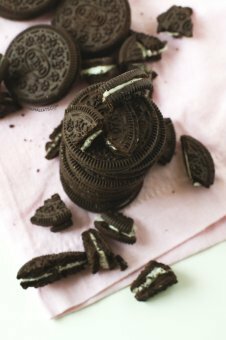 If you’re a celiac or you’re on a gluten-free diet, you can make these homemade gluten-free Oreos, they are vegan, much healthier and also wheat and gluten free. I don’t eat processed food very often, but I love Oreos and I eat them once in a while, in addition, it’s not easy to find vegan cookies in the stores here in Spain, so if I want to buy vegan cookies, Oreos are the best choice. I’ve used coconut sugar, but you can use other sweetener, such as brown sugar, syrups, molasses, stevia or your favorite one. I also love agave syrup to make ice creams, it works so good. If you don’t want to use soy milk, you can use coconut milk instead, I’ve made other ice cream recipes using it, and it’s a good choice too. I haven’t used others plant milks, so I don’t know if they could work, but you can try! To make your own homemade ice cream is really easy, and it’s much healthier (and cheaper) than store bought, even if you use processed food such as these Oreo cookies. 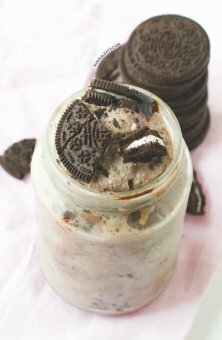 If you’ve never made ice cream at home, you need to try this recipe, it’s so simple and you’re gonna love this creamy and refreshing 4 ingredient vegan Oreo ice cream. 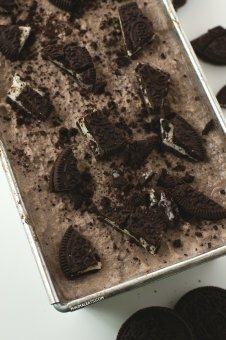 If you've never made ice cream at home, you need to try this recipe, it's so simple and you're gonna love this 4 ingredient vegan Oreo ice cream.